If you are like most people, you probably have a lot of used computer paper lying around at your home or in your office. 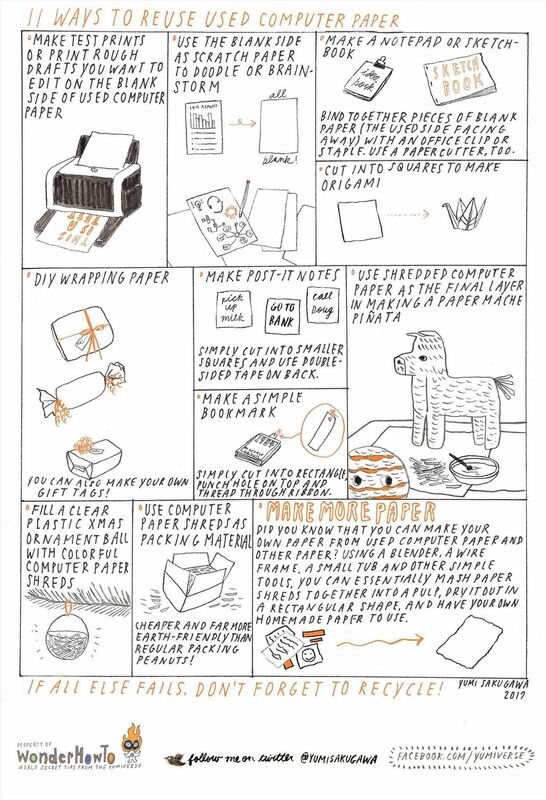 Before you toss them directly into the recycling bin (which you should at least be doing if you're going to be getting rid of them), what are some crafty and practical things you can do with used computer paper? Cut paper into small rectangular pieces and make your own idea notebook or sketchbook. If you make square pieces, you can make origami animals or with the help of double-sided tape, your own DIY post-it notes. For craftier people, you can use paper shreds as the final layer when making paper mache sculptures or simply reuse the blank side of paper as wrapping paper or to make a very simple bookmark. For less crafty people who simply want to put it all through the shredder, shredded paper makes for very cheap and convenient packing material. Got your own practical reuses for used computer paper? Share with us by commenting below!